Here is a strange little coincidence that might not have been noticed before, assuming that few F1 fans are also deeply into poetry. A minor item on the Autosport site recounts how Esteban Gutierrez has been confirmed by ART Grand Prix as one of their drivers for the Formula 3 Euroseries this year. Hardly earth-shattering news, one might think, but it was that name, Gutierrez, that plucked an obscure chord in my memory. Studies the sunlit pattern on the floor. What the fairies do and what the servants say. Week by week, offends and perplexes more. With the imperatives of "so it seems"
And may and may not, desire and control. And that one who went his own way. Pray for us now and at the hour of our birth. I leave the interpretation of the poem to you but would point at the odd coincidence of the name, Guiterriez. Okay, the spelling is slightly different, but the intervening eighty years should allow us some leniency in our consideration of Eliot's vision. Was old Thomas Stearns unconsciously referring to the advent of a bright new star in the motor racing firmament in 2008? And who is this Esteban Gutierrez anyway? 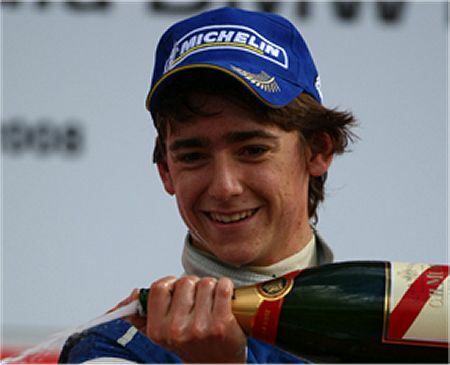 Brief research reveals him to be Mexican, 17 years old and already the Formula BMW Europe Champion of 2008. That seems a pretty good omen for the future and it might just be that we shall be hearing more of this young hopeful in the years to come. Oh, I admit that it's a stretch but imagine how good Eliot and myself will look if Esteban proves to be the Senna of tomorrow. And if he doesn't, who will remember a rather odd little blog post from the off season of years before? Although that line is somehow memorable, as evidenced by its echo produced by an article in Autosport. "Pray for Guiterriez, avid of speed and power..."
For children who say their prayers." >>From a hundred car tops and hoods. I am truly amazed and dumbstruck. Certain I was that posting a poem, even one of Eliot's, was blog suicide, yet had to point out the strange coincidence in this one - and now my readers come back at me with their own favorites. The world is a wonderful place and my readers its finest products! Great poem, by the way, Nick. I love it! On a Tenuous tangent I reveal a poem I scripted to myself after Challenger, and I thought it felt apt for the late great one. For we paved the path to there new home. By the way, great dig up and what a memory, Clive! "Your fear of death is but the trembiling of the Shepard who stands before King. Is he not glad of the mark of the King, but yet is He not mindful of He`s treambling"
Since this year is the 250th anniversary of the birth of Robert Burns I decided to find one of his many poems that could have some meaning in F1. Tam O'Shanter is about a man who drinks way to much and spends too long in the pub and comes very close to being caught by some witches when he spots a particularly attractive one wearing a short shirt (cutty sark). It is a warning of the dangers of excess. Can't think who that would apply to in F1. Don't worry if you don't understand a word of it Burns has a fabulous sense of rythm and makes words flow better than anyone I have ever read. If you want an explanation try http://www.rabbie-burns.com/the_poems/tamoshanter.cfm.html where you will find some of the words translated. Thou drank wi Kirkton Jean till Monday. O'er a' the ills o life victorious! Whare Mungo's mither hang'd hersel. A winnock-bunker in the east. Five tomahawks, wi bluid red-rusted. Which even to name wad be unlawfu. Now Tam, O Tam! had thae been queans. .
For ae blink o the bonie burdies! Wi monie an eldritch skriech and hollow. Kate soon will be a woefu woman! A running stream they dare na cross! An left poor Maggie scarce a stump. Remember Tam o Shanter's mare. Great post Clive, and I don't usually like poetry! However, these ones were very enjoyable esp. Tam O'shanter. Luckily, I worked with many Scots and could interpret it fairly easily.